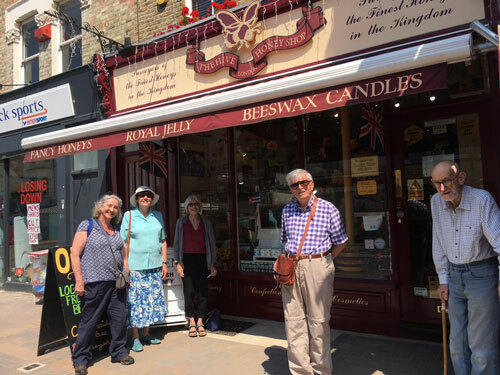 We were contacted by the secretary of the Wandsworth Appreciation Society asking if we would agree to a free bee talks for a select few of their members. We were more than pleased to give back to our local community that support us. The shop was closed for a private lecture covering our long history and committed stay of 24 years in Wandsworth. During that time we have seen regular customers become good friends, nursery school toddlers grow up and go to Uni, all filling us with great pride and sense of purpose. In this age of mega stores and sales staff that know nothing about what they sell, or careless to stop to have a chat or care even less to get to know you, its nice to know there are still a few ‘shops on the corner’ that still make the time. We are one of them. We really enjoyed sharing our story, our bee knowledge and our love for all things bees! Hope to see you all again soon! Thank you very much for giving the Wandsworth Society group such an informative and lively talk. I am sure we all have a very different view of honey production and bees now. We enjoyed the marketing story behind Manuka – I am delighted you saw them off! I will be back to The Hive – lots to choose from – your shop a veritable treasure trove – everything from honey to lotions – all with a very high feel-good factor – the purity of it – the simplicity; we all understood hard work and the dedication which goes into the final product; those little bees are very lucky to have you.